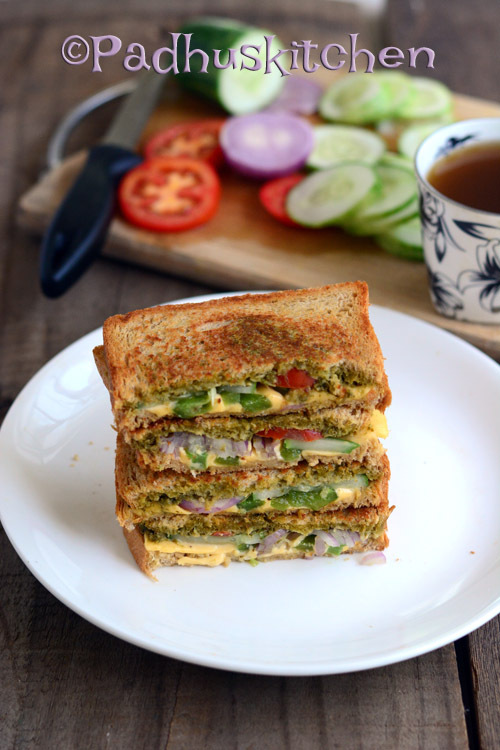 Pesto sandwich is one of the quickest and most tastiest sandwich which can be put together in minutes. This delicious sandwich is stuffed with homemade pesto, fresh cucumber, sliced onions, juicy tomatoes, roasted bell pepper and cheese. It is simple to make, provided you have pesto ready. It is perfect for a quick and healthy breakfast or lunch or snack. Today we will learn how to make Pesto Vegetable sandwich following this easy recipe with step wise pictures. Roast bell pepper on fire until the skin gets charred. Once it cools, remove the black skin and cut it lengthwise. Keep it aside. You can roast it on oven also but since it is only 1 small bell pepper, I roasted it on direct flame. You can use ready made pesto or homemade pesto. Refer the recipe for homemade walnut basil pesto. Take 4 bread slices, spread one side of 2 bread slices with generous amount of pesto. Top the pesto with 1 slice of onion, 1 tomato slice, one cucumber slice and some chopped roasted bell pepper. Place a cheese slice on the other 2 bread slices (picture below). Now cover the pesto spread bread slice with cheese side facing down. You can enjoy it without toasting the bread. I love my bread toasted. If you like toasted sandwich like me, then proceed to the next step. Heat a little butter in a griddle/tawa, place the sandwich and toast both sides until golden brown.If you have a toaster with you, you can toast it using that also. Repeat the same process for the other 4 bread slices. Enjoy it for breakfast or for lunch or as a snack. It is incredibly satisfying! Refer my Pesto Pasta Recipe and more Bread and Sandwich Recipes. Can we use boiled egg for the sandwich? Similar to guacamole sandwich recipe. ?